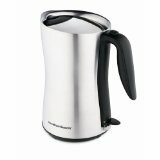 Measures 10.4" x 8.5" x 10.4"
You will be very satisfied if you purchase this electric water kettle. 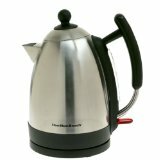 It has a sturdy on/off switch and can boil water faster than a microwave and safer than many other methods including using a stovetop kettle. You have no chemically smell or aftertaste. The handle remains cool and is ergonomic, and has enough clearance for comfortable handling. The water level gauge is very easy to read. Very little plastic construction, mostly constructed of stainless steel. The heating element is concealed, has simple functions and a good dripless spout. An added plus is the reasonable price. Unit measures 8" x 6.9" x 8.9"
Very inexpensive electric kettle that is simple, yet boils water fast and is well constructed. Only takes a couple of minutes to boil a liter of water. Simple on/off button to operate, no fancy parts to break. The sides are transparent making it easy to see how much water is in the kettle. 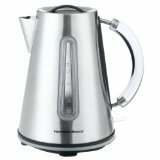 Economical Hamilton Beach kettle with no bells or whistles. Just a simple container with an on/off switch and a see through body. Heating element is concealed and it has an automatic shut off for safety to give it boil dry protection. Heats up fast with 1500 watts of power for boiling.